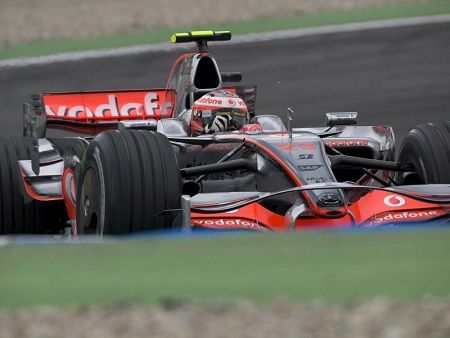 I was pleased to see that McLaren have already confirmed Heikki Kovalainen as a driver for 2009. Although Heikki is a long way behind Hamilton in the championship, he has had some pretty poor luck in the races and that could change at any time. Heikki may not be quite as quick as his team mate but this probably suits the team after their year of squabbles between Hamilton and Alonso - plus Heikki does not complain if he is not as fast as Lewis, he just tries harder. What I enjoy most about McLaren's announcement, however, is the fact that it makes Willi Weber look a bit silly. No doubt Willi had some devious plot in mind when he said that Rosberg would take Kovalainen's seat next year and that has been blown apart by the team's prompt response. Perhaps we all enjoy those moments when the "experts" are proved to be as fallible as anyone else. In contrast to McLaren, Gerhard Berger has said that Toro Rosso will not confirm any drivers for 2009 until September. The Alonso factor comes into play as the team managers wait to see where he will jump. Rumors have him going to Ferrari (although that depends on Raikkonen retiring from F1), Honda, BMW and even Red Bull, but the likelihood is that Fernando will stay with Papa Briatore for another year. No one can be quite sure of the relative prospects for the teams with the changes in the regulations and Alonso might as well stay with Renault while the re-shuffle, if any, takes place. Probably, there will be no change in the pecking order of the teams; money may not be the final arbiter of competitiveness but it does have considerable influence. Rich teams are not necessarily the fastest but the top teams will always have enough money for the development required to stay ahead. The early announcement from McLaren bodes well for the future of the team, too. Whether by accident or design, they have two drivers that function well together and the team can concentrate on staying ahead in the race for development of the car, therefore. With this set to continue into 2009, they must be favorites to continue as the team to beat. Their rivals, Ferrari, are also likely to continue with their existing drivers but that is not so happy a situation. Raikkonen seems to waver over the issue of retirement and cannot be content with his results so far this season, Massa has to perform well at every race to ensure that he remains in favor. With the team looking a bit chaotic at times, one has to wonder whether they will still be a top team next year. Heikki's prospects look very bright, thanks to all this. He will have plenty of time to prove himself and his streak of bad luck cannot go on forever, can it? McLaren might find themselves in the situation that they actually like best, with a star driver bringing in the race wins and a dependable back-up totting up the constructors' points. It worked for a long time with Hakkinen and Coulthard and there is no reason why this should not be the beginning of a similar pairing. Agreed - glad he's got the gig for another year. I also saw he made remarks about wanting to spend the rest of his F1 career at McLaren which is quite a thing for a driver who's only halfway through his second season to say. However McLaren limiting him to a one-year extension suggests they may be shopping around for someone with a touch more gigastar quality (they may believe) about them in 2010. Yes, Clive, I agree about Wily Webber, he seems very silly on this moment. Another point for me is about contracts respectfulness. BMW is about to confirm Nick to next year as another prove that the best way to reflect a good image to the fans and sponsors is just respect the driver contracts. This is what I expect from Ferrari in what concern Felipe´s contract. I think that the “Sapiente” Dr Theissen thinks on the same way. Keith: I think McLaren will prove very wary about hiring megastars in future; 2007 was a terrible year for them and it was, at least to some extent, caused by a star driver. The reason for only extending Heikki's contract for another year is because they don't have to do any more than that. If Heikki comes good, they have a confirmed and happy driving partnership for the future. If he does not, they still have plenty of time to see how drivers like Rosberg and Kubica get on. Becken: Agreed, Theissen seems to prefer stability in his driving team and he has that now. There remains a chance that Heidfeld will not keep up his recent improvement (in which case, I think Dr Theissen would be looking for a replacement) but Nick is the great survivor and will probably retain his seat for next year. It makes sense to hang on to Kubica as well, since he is showing terrific potential and liable only to get better. Kovaleinen rather reminds me of Frentzen when he was alongside Villeneuve in the Williams.Heinz-Hararld had problems finishing races and had more than a fair share of bad luck along the way but his form was rather patchy.There were a few races where he was anonymous ( Brazil , Spain in particular where he was out of the points and he made mistakes at Silverstone and Monaco) yet he also had the pace to win Imola and make Schumacher work hard to win in Suzuka). Having said all of that I can understand why they are keeping him - he just gets on with what he's doing and doesn't throw tantrums.I think a one year extension is fair given his form this season - apart from Silverstone qualifying he's not set the world alight exactly. Interesting comparison. Heinz-Harald was really quick when everything went right and it was a pity that his time at Williams was soured by the fact that he wasn't Damon Hill! In lesser teams where he was happy he often drove tremendous races. Kovalainen has the advantage of not being quite so sensitive, however, and will give of his best at all times, I think. hmmmm. fancy doing a piece on the underrated drivers of the last 15-20 years and where things went wrong? i always liked frentzen. panis and wendlinger too (though where it went wrong for him is obvious). i think kovaleinen's got some tough to him. some of the other choices might not be quite as mentally strong about partnering hamilton. this guy just gets on with it. Delighted McLaren have re-signed Heikki. It's good for the team and for him. I don't think the one year extension means a lot as McLaren have never been into long term contracts.